Ring of Combat 26 returns to Atlantic City on September 11th, and while the original incarnation of the card is long gone like Chuck Liddell's inability to tango is long gone, there are still a number of bouts to watch out for. A list! Victor O'Donnell vs. Costa Phillippou - O'Donnell came out of nowhere to win the ROC middleweight belt at the last show, but his knack for recovering from heavy punches and doling out fist salad will get its first real test when he takes on Team Serra/Longo badass Phillippou. Phillippou is a cross between a technical kickboxer and a Terminator, so this match-up should provide fireworks. Chris Liguori vs. Dwayne Shelton - Liguori is the Northeast's lightweight high-water mark, meaning that he's so good, defeating him means you're worthy of the UFC (see Jim Miller, Marcus Aurelio). Shelton is a scrappy dude from Virginia with solid submission defense and strong ground-and-pound skills. Expect the local guy to gain top position and hold onto it like a retiree holds onto their winning lottery ticket. 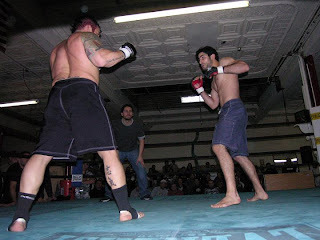 Chris Schlesinger vs. Nabih Barakat - "Crazy Chris" is a fast-paced and frenetic grappler and face-puncher and Nabih is another technical Team Serra/Longo striking specialist. As Schlesinger has been around for a long, long time, this one is really an old blood vs. new blood match-up, with the old blood still very able to squash the new blood. Gian Villante vs. Carlton Haselrig - Both Villante and Haselrig are behemoths who used to play football before turning to MMA, so expect the referee to say "Hut! Hut! Hike!" and these two to charge each other and clash. Then the referee will blow a whistle and throw a flag down, and cheerleaders will go "Rah! Rah! Rah!" Or something like that. Rafael Sapo vs. Sean Salmon - In the battle between the heavy-handed Team Renzo jiu-jitsu black belt and the UFC vet with the chin of glass, there can only be one outcome: shattered glass everywhere.